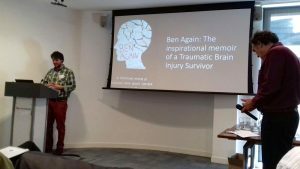 The September conference provided an opportunity to learn about four different ideas and approaches after brain injury. From a book to a website to a food project and the resurrection of a career, there was certainly variety and a lot to think about. Dr John Murphy, Specialist Psychiatrist and Honorary Lecturer, St Georges, talked us through his brain injury journey, which began with a car accident in December 1984. At that time John was a 25 year old doctor, 4 months post-qualification who was enjoying his first job at The Middlesex Hospital. Despite serious injuries sustained in the accident, John was hopeful that at some stage he would be able to return to work. The first tentative steps towards this were taken in September 1986 where John undertook work as a research assistant. Building on this, John was able to pursue a phased return to work, which included training in Psychiatry, then moving into general practice training leading to him becoming a GP partner for 2 years before returning to Psychiatry where in John’s words he has ‘survived for 19 years’! A remarkable and indeed inspiring story. 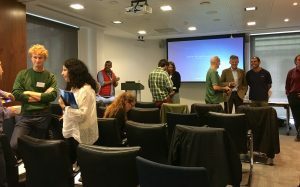 ABIL extend thanks and appreciation to all the presenters for such an interesting, diverse and inspirational conference.